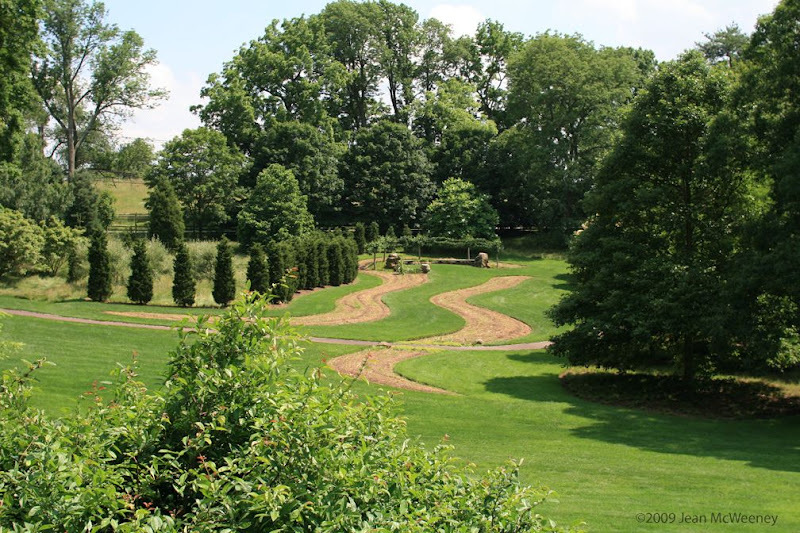 As I said in my previous post about Chanticleer, it is a garden of Details (with a capital D). 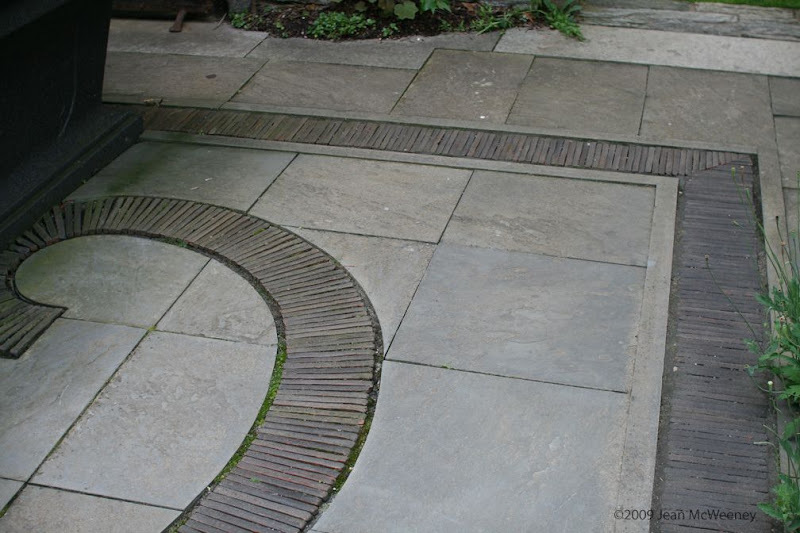 One detail trick used by many designers, and used throughout this garden, is a transition change in paving. This helps denote entry to a new space. Below is the entry off the walkway into the arbor above the Pond Garden. 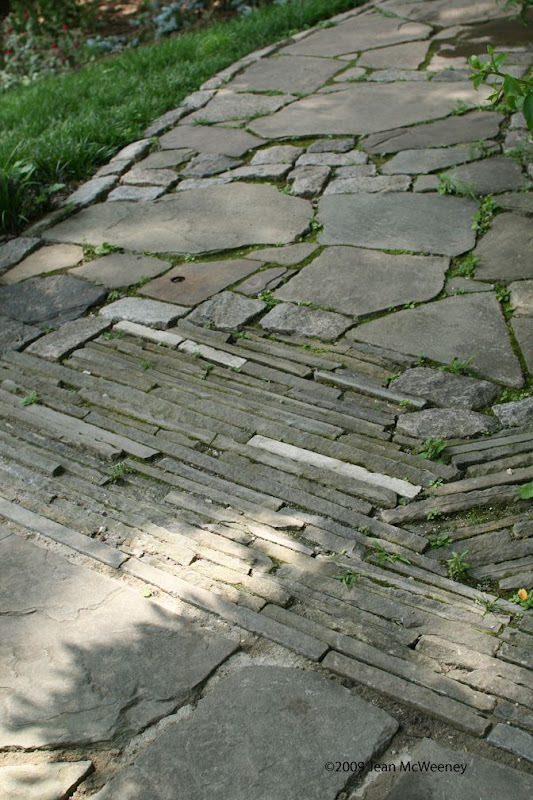 Another interesting floor is the mosaic "rug" of tile, granite and slate in the Ruin Garden. 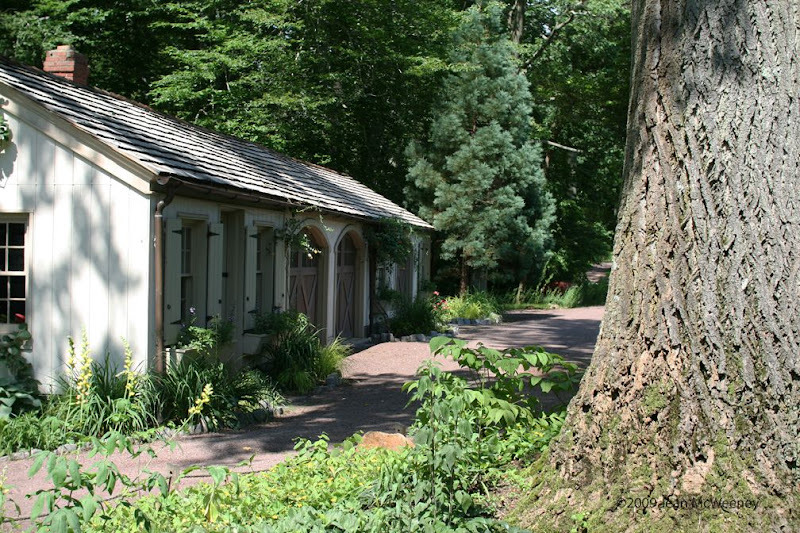 This garden was built on the foundation of an old house and includes several "rooms". 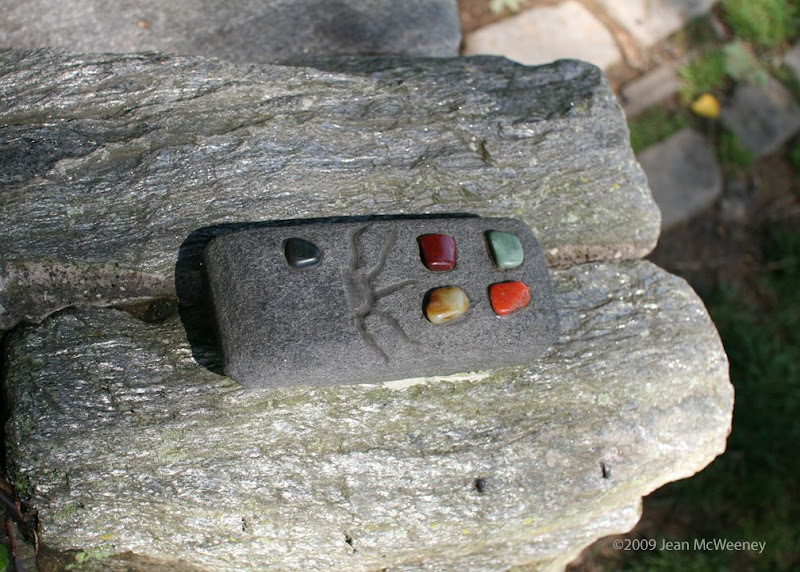 The "rug" was beneath a black sarcophagus-type water feature. Really, it was mostly an elevated reflecting pool although you could also have considered it a dining table (of sorts). 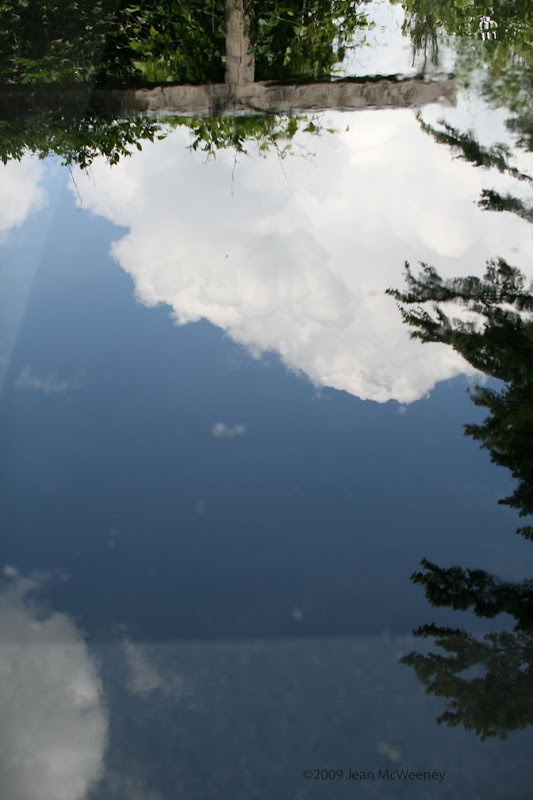 Below is the reflection in the pool. There were a couple of outdoor "couches" near the area. Note the detail of the remote control. As you leave the "ruins", you go down some wide stairs into the Gravel Garden. 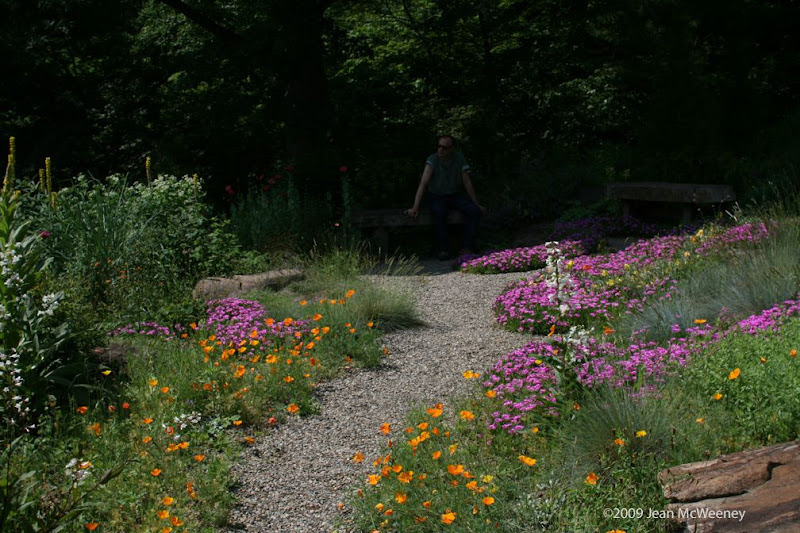 I really loved this part of the garden (xeric gardens have appealed to me for a long time, probably from doing most of my gardening in dry Texas). Unfortunately by this time in our tour, the sun was really blasting, so none of my photos truly do this part (or any part) of the garden justice. 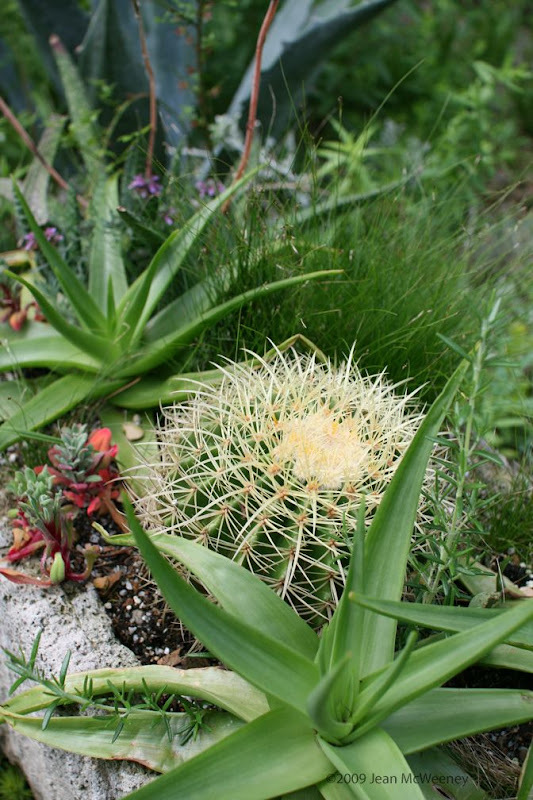 Many of my favorite plants were in pots nestled into the dry garden. The pot below made me laugh. Note how they highlighted the broken pot. Again, it's all in the details. More of my favorite plants. From the Gravel Garden you have a beautiful view of the areas you've already travelled through. Below is The Serpentine, a planting of wheat and barley although it looked like it was just ready for planting. A poppy field with some spotted (giraffe or leopard??) Adirondack chairs. Leaving the Ruin and Gravel Garden you pass through an orchard (which is underplanted with many bulbs and most be glorious in spring). Then you come to the Cut Flower and Vegetable Garden. How would you like to have a potting shed like this one? 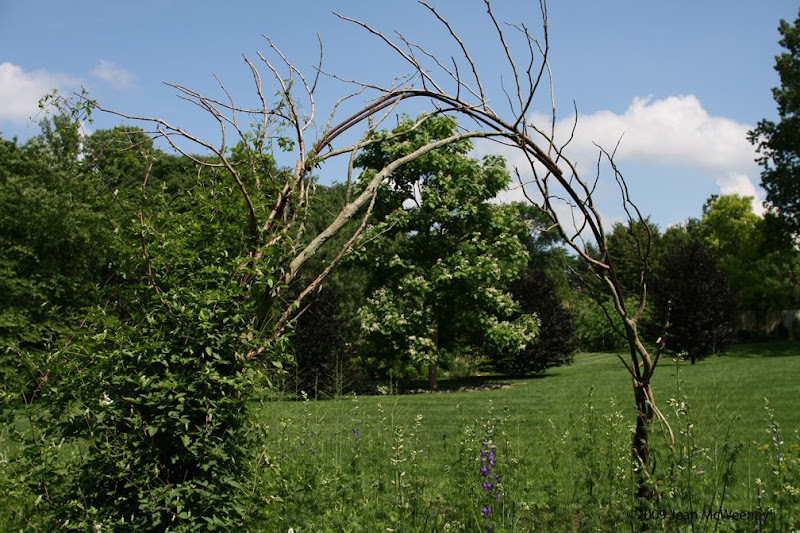 There were many handmade arches in the Cut Flower Garden. I'd love to be able to build some of these. 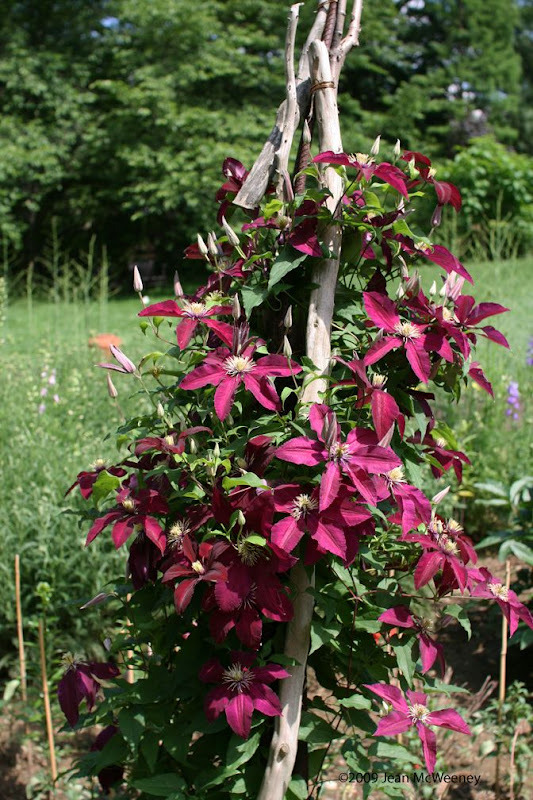 The arches were a perfect place for clematis. The Tennis Court Garden (yes, site of an old tennis court) was stunning. 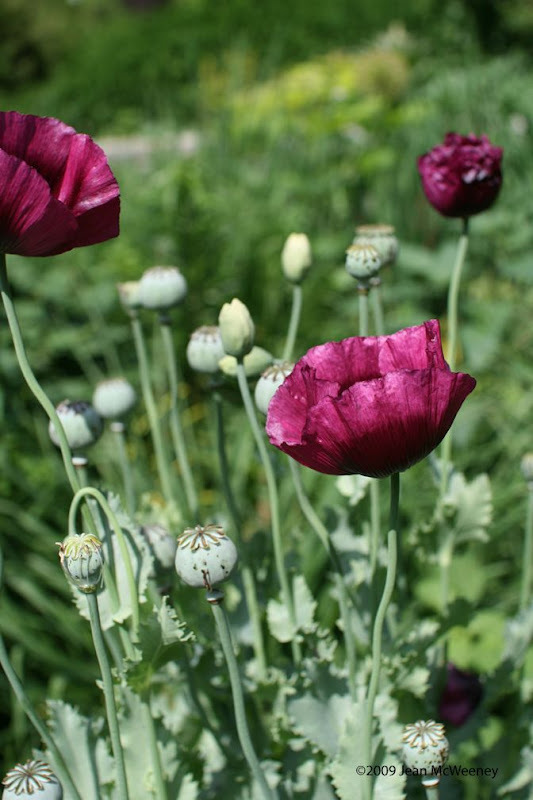 It has large perennial beds, rose arbors over a bench, poppies and a water feature. How I would love to return to this garden in other seasons and at other times (like early morning or in a misty rain) and with more time to spare. 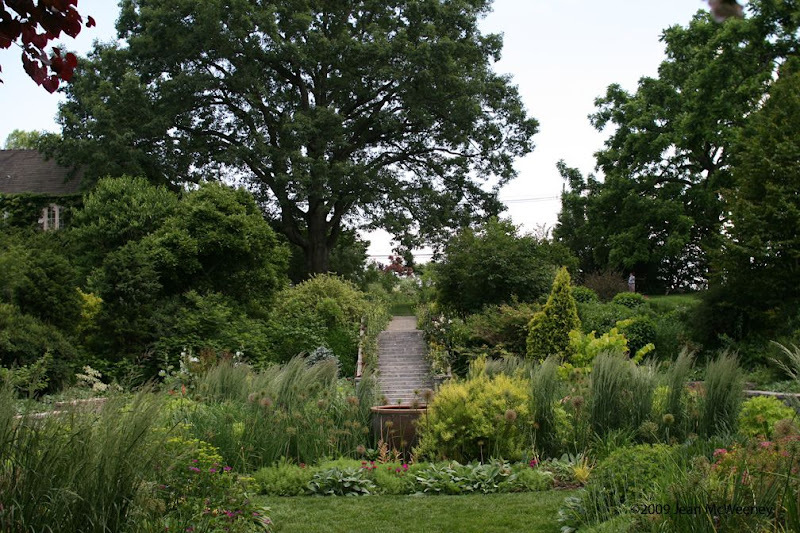 For me, Chanticleer was full of surprises and had a high level of fun,. It has a lot to teach about good garden design, but in a mostly understated way. I hope you enjoyed this armchair tour; you can click here for Part 1 of the tour. Beautiful, Jean! 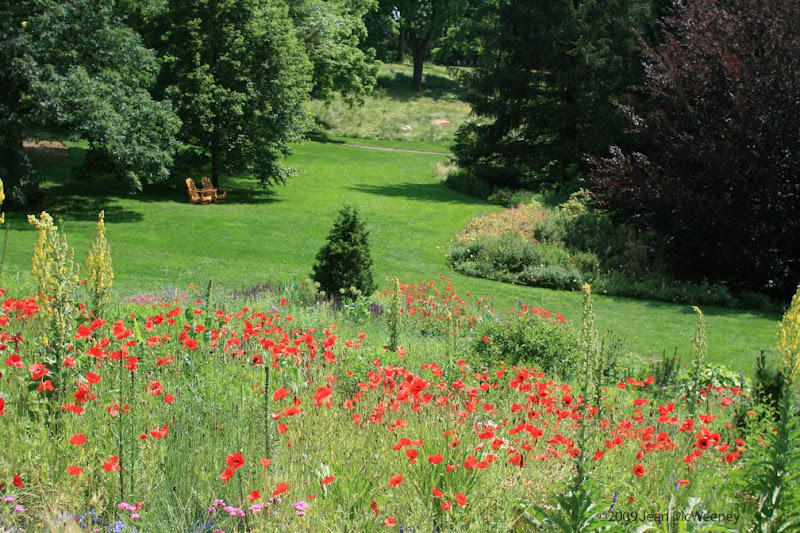 This just shows how many lovely public gardens are out there; I've never heard of this one. 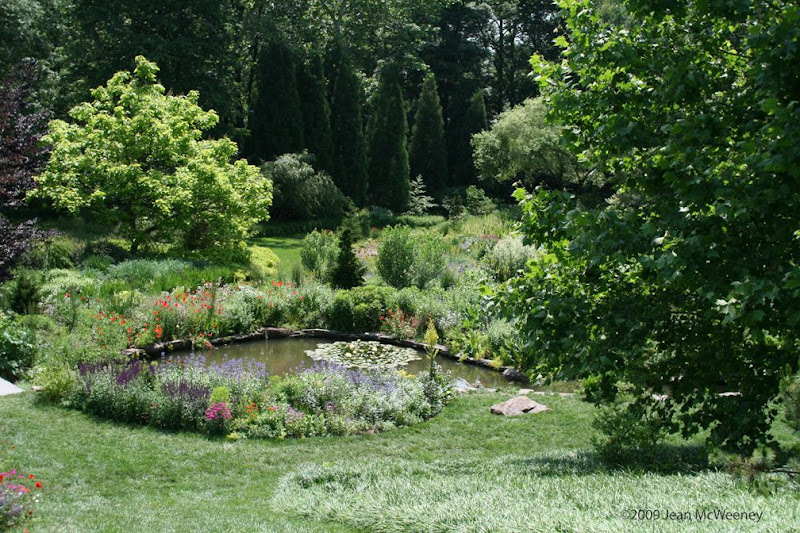 I like the gravel garden, too, but I'm also partial to the pond garden. I much prefer them to the "edgier" details shown in your previous post, but touches like the stone couches certainly add some humor here. A great way to spend the afternoon--hope you made it to New York in time for dinner! thanks for the tour I really enjoyed it. These garden is a little glimps of what heaven must be..... I LOVE IT!!!! Thank you for bringing it to us via blogger. I love the jems for remote control! I didn't see the "remote control" when I was there last summer. How funny! 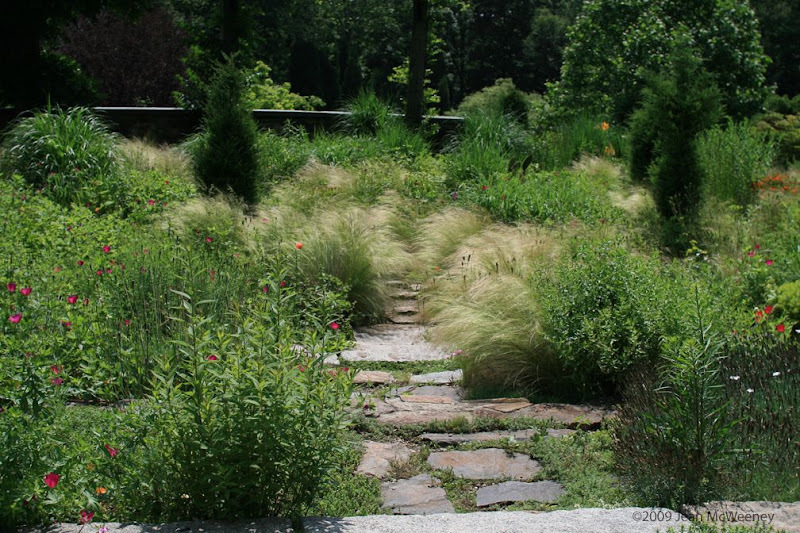 Like you, I'd love to go back to Chanticleer in spring to see the bulbs, or in fall to see the grasses and fall foliage. But high summer was a great time to see it last year, and I'd happily go back in July again. If the people at Chanticleer saw these photos, they most likely would invite you to be their official photographer. Extremely interesting post, Jean. Thank you. One of the places I want to visit one day. Thanks for sharing! 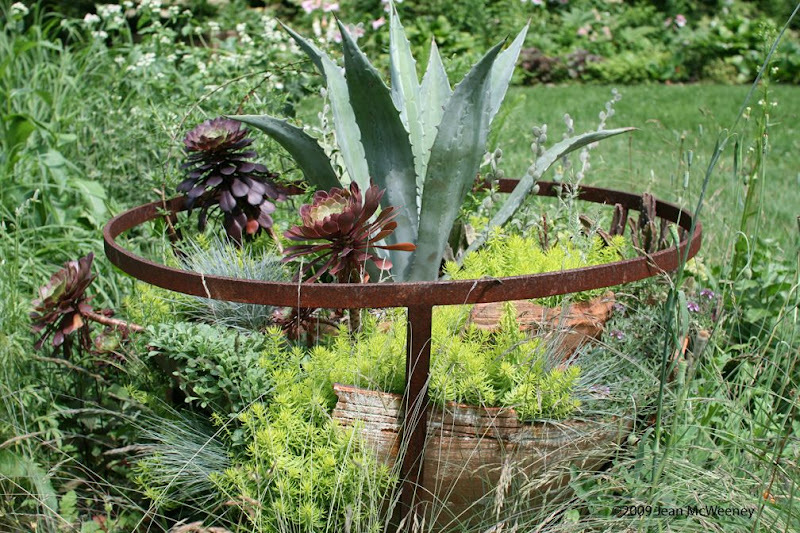 Great details of an unusual garden. 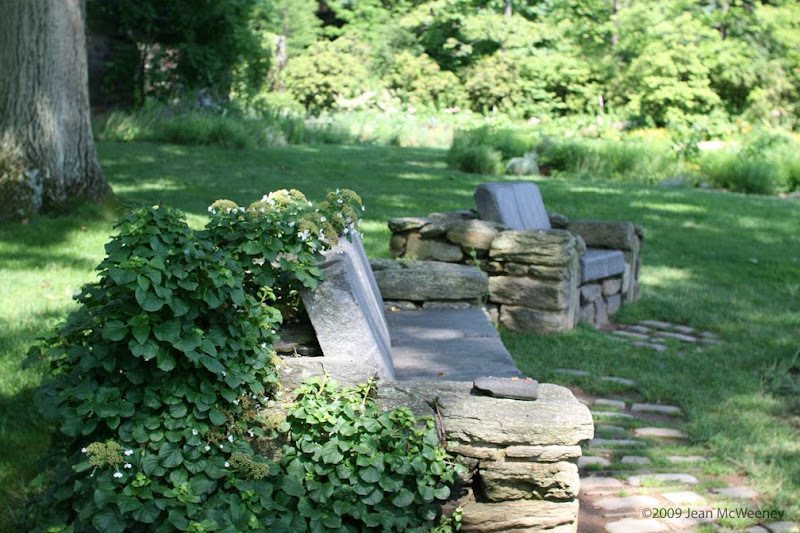 Love the tennis court garden and the glen-like area of Tree Lilacs with the tall blue green grass... and all the lovely rustic arches and supports... the rock chairs with remote are very clever. Beautiful photos. Well Done! Thanks for sharing.